In case you missed it on Facebook and Twitter. 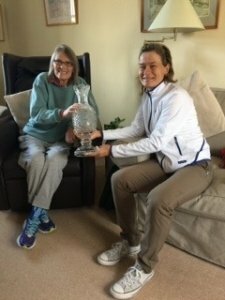 Catriona Matthew and the Solheim Cup paid a surprise visit to one of our local golfers. The semi final line up is nearly complete. 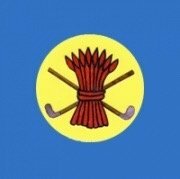 The quarter finals seem to have been tightly contested so far, with one tie going to the eighteenth hole and another needing an extra hole to get a result. Now that we have packed away our Christmas Decorations, we can relax and start planning our 2019! There is no better way to begin the Golf Season than with the Pre-Season Lunch. 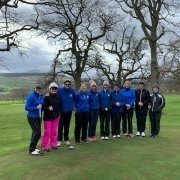 This year, in keeping with decision to keep moving round different clubs, we are heading to Haddington Golf Club. The Club has new fantastic Caterers, East on the Green. Laura McSweeney and Kurt Edwards have been receiving fantastic feedback since their arrival at Haddington so we are very excited to be visiting there. Click on the link for full details of the menu and booking form. If you use the online booking please can you either send me a copy of the form back by mail, email or even a photograph by text showing your choice of meal. You are welcome to sit with your friends or come along on your own and make new friends. Tables will be in 8’s or 10’s depending on numbers. Please let me know your choice of seating arrangement. We look forward to seeing many familiar faces and new faces at the lunch. We suggest you book early to avoid disappointment. A gentle reminder that your subscription is due by the 31st of January. The subscription remains unchanged at £25 for full membership; £10 for juniors and £10 for non-playing members.